The World Values Survey Cultural Map, 2005-2008. A great example of how cultures differ around the world. Notice how countries with strong environmental movements tend to correlate with both secular-rational and self-expression values. Credit: Ronald Inglehart & Christian Welzel. At its most fundamental, environmental conservation is about cultural change. Elite cultures such as those found in government institutions must shift towards embracing conservation principles. Broader society must change its norms, values, and philosophies, and the behavior that results. And while we have a long way to go everywhere, change is most needed in non-western governments and societies where conservation is a particularly foreign concept. We know this in the environmental community, and yet I don’t hear much talk about the role of culture in conservation. Is this because it is too fuzzy? I don’t think so. We talk about shifting debates and inculcating new values all the time. Is it too taboo? Maybe. To talk about another society’s culture does sound a bit imperialistic. Or perhaps the field has too few social scientists? I’ll say ‘yes’ to that. Whatever the reason we don’t talk about the role of culture, this is a conversation that must be started. Most importantly, because people matter. The most brilliant conservation system in theory will not work if the people implementing it aren’t on the same page. Rob White at the University of Tasmania provides a good starting point for this conversation with his illuminating book, Crimes Against Nature. In his first chapter, he provides a set of three paradigmatic eco-philosophies that guide environmental policymaking: anthropocentrism (human-use first), ecocentrism (human needs balanced against ecosystem needs), and biocentrism (other species first). White is of the view that global society must embrace a more ecocentric view (and thus achieve long-term ecological sustainability). Anthropocentrism – Exploit the forest to its full commercial potential with the least costly method, and legislate to prevent over-extraction and deal with conflicts amongst industries and local populations. Ecocentrism – Strike a balance between the need to utilize resources for human survival and the need to benignly affect the ecosystem, using cutting methods that maintain the long-term ecosystem wellbeing requirements, and legislate to ensure the limits of ecology are not surpassed. Biocentrism – There should be no impact on any old growth forest because they have intrinsic value, providing the only habitat for certain forest dependent species, and legislation should be to preserve these areas as untouched. Using this typology, the challenge becomes: how do we shift a society from having an anthropocentric worldview to one that is ecocentric? Is this just a matter of information sharing? Explaining to the public how healthy ecosystems matter for their health and income? Or for the wellbeing of future generations? Or does it depend on something deeper, like empowering nascent environmental movements or economic development? The World Values Survey (figure above) suggests to me that environmentalism will depend on these deeper systemic changes. 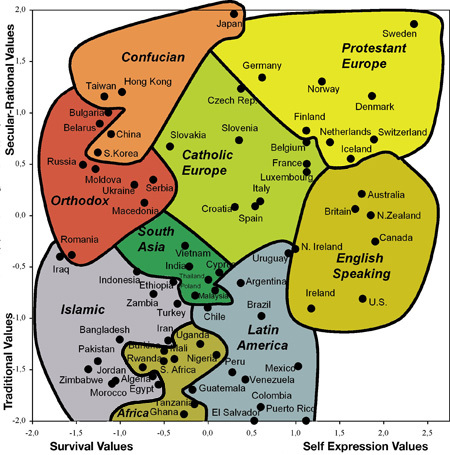 If you notice, countries with ecocentric orientations/environmental movements are highly correlated with secular-rational and self-expression values. For clarity, these values tend to be understood as both cause and consequence of economic development. This gives me an immediate cause for concern. Culture, after all, is what it is because it persists over time. And global economic development has been quite slow going over the past half century. However, I think we may have a few reasons for hope. This is, after all, a very different world than when the environmental movement began in the west. Never before have we had such communications technologies, meaning there is great opportunity to build transnational environmental networks that bridge the North-South divide, to empower, to share ideas, and to grow. Advances in environmental accounting mean that governments everywhere are beginning to think in terms of ‘environmental capital’. And, finally, there is no rule that a non-western environmental movement must look much like that found in the west. Perhaps something less transcendental and more based around individual political parties will lead the way? so interesting. I really like what you say at the end, about how a non-western environmental movement does not have to mimic that of the west. I just did a quick search to see what interesting national environmental protection initiatives are taking place in countries not in the typical secular-rational/self expression realm of your map. I found one pretty quickly: Jordan (which falls in the traditional/survival values area), has a National Environment Strategy that contains ecocentric language and lays out ambitious goals for environmental protection and sustainable development. While this is only one example, I think it is promising to see that a complete cultural shift may not be mandatory for ecocentrism to be embraced. What do you think we can learn from the Jordan example? It would be interesting to study where Jordan’s ecocentrism orginates from, and see what other unexpected enviro-focused nations exist. If Jordan’s commitment is legit, I’d think the example would show how elite cultures may be ‘on-board’ with environmentalism, while that of broader society still lags. And if not legit, then it’s just greenwashing, and we see it all the time. Many governments make beautiful environmental commitments at international meetings and never do much to implement them. The term “national environment strategy” sounds very World Bank-y. I’d wonder if they didn’t put this strategy out there to better improve their diplomacy with the west and its multilateral institutions. Culture is everything, and I feel a lot of people do miss that. It is the mindset that has been ingrained for a millenia in some civilizations much older than the west. The problem begins when it is your “culture” that allows for such atrocities such as overfishing and shark finning to persist beyond your own borders. I am currently studying in Fiji where the people have a genuine care for their environment and are trying to conserve what they have, if not for their own survival. However, when foreign fisherman come in beyond their reach and deplete their waters, what is to be done then? One culture’s norms ruins what another has tried to save. Although I too agree and have seen, that Western conservation practices do not work everywhere, a global culture shift must occur. For what one culture doesn’t exploit, another will. I’m sorry to hear about the foreign fishing. I’m curious, what nationalities are doing most of the work? Chinese long-liners are the worst culprits. They build a hospital or a road for these people in exchange for fishing permits. The permits are for a couple of ships and they bring an entire fleet. Then when their ships are too worn down to be of any use, they leave them in the harbor to rust and degrade. Here there is no one to stop them and the need for money outweighs the need for a healthy ecosystem. A sad but true reality.